Regular readers know that I favor holding gold when inflation is a perceived threat. Gold is less an investment than a store of value, a means of retaining purchasing power. Gold is not an investment with which to make money. It is a means of protecting money you already have. There is no certainty regarding an outbreak of inflation of hyperinflation. These are not economic events even though many consider them such. They are outcomes initiated by political action(s). Inflation and hyperinflation are everywhere and always political events. It has been said that to believe in gold is to distrust politics and politicians. While I have always distrusted politicians, I have not always owned gold. Only because I believe inflation is likely do I use gold as a hedge against a loss in the purchasing power of cash. Nothing can destroy a nest egg or a society faster than high inflation. Hyperinflation is devastating. One would expect gold to fare well during such an extreme circumstance, and it did – in German marks, quite dramatically. In January 1919, one ounce of gold traded for 170 marks; by November 1923, that same ounce was worth 87 trillion marks. Take a look. Inflation was at first benign, then began to grow rapidly, and quickly became a monster. What’s important to us as investors is that the price of gold grew faster than the rate of monetary inflation. 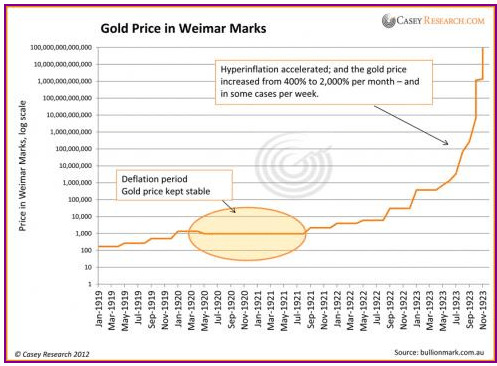 The data here reveal that over this five-year period, the gold price increased 1.8 times more than the inflation rate. The implication of this is sobering: while hyperinflation wiped out most people’s savings, turning wealthy citizens into poor ones literally overnight, those who had assets denominated in gold experienced no loss in purchasing power. In fact, their ability to purchase goods and services grew beyond the runaway prices they saw all around them. The level of inflation experienced in Germany is incomprehensible to most Americans. Will it occur here? At this stage no one knows. There is nothing unique about the U.S., however, that makes it immune to what happened in Germany. Whether…[hyperinflation] occurs here or not depends entirely upon what the politicians do. Based on their history and character, there is little reason to be optimistic. 5. Will This Be The USA in 2012? 10. 2012: More Money-printing Leading to Accelerating Inflation, Rising Interest Rates & Then U.S. Debt Crisis! Got Gold? 11. True Money Supply Is Already Hyperinflationary! What’s Next? 12. How Likely Will Hyperinflation Occur in the U.S.? 13. 21 Countries Have Experienced Hyperinflation In Last 25 Years – Is the U.S. Next!